Shoebuy is the largest retailer on the Internet focused on all categories of footwear and related apparel and accessories. Shoebuy has partnerships with over 1,100 manufacturers and represents over 1,000,000 products from top brands including adidas, Aerosoles, Allen-Edmonds, Bass, Bostonian, Brooks, Bruno Magli, Clarks, Crocs, Dr. Martens, Easy Spirit, ECCO, Florsheim, Franco Sarto, Hush Puppies, Johnston & Murphy, Keds, K-Swiss, Mephisto, Merrell, Naturalizer, New Balance, Patagonia, PUMA, Reebok, Rockport, Samsonite, Saucony, Sebago, Skechers, Sperry Top-Sider, Stride Rite, Stuart Weitzman, Timberland, and many more. Shoebuy is rated one of the top eTailers in the country for outstanding service by BizRate and in the top 10 in online retail satisfaction for apparel/accessories by Foresee Results. Wow! Browsing Shoebuy is one of the single most exciting experiences a girl can have! They offer all of the brands I have come to know and love, plus many that I wouldn't normally be able to find in area department stores. Preparing for the warm weather has been made easy (and so much more fun) with the extensive selection of sandals available for the entire family at Shoebuy! As a mother, I am constantly on the move (aren't we all?) so while I'm looking for comfort and style, I NEED my shoes to help me maintain my high level of activity. Shoebuy had just what I have been looking for! 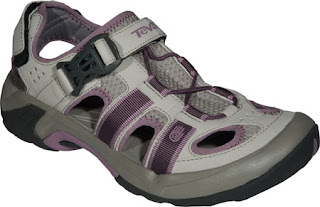 The Teva Omnium Sandals (pictured above) are perfect for active mom's like myself; they offer the perfect amount of support and are incredibly comfortable. Keeping my feet cool in the warmer months without slowing me down (chasing a toddler around the playground in flip-flops can be next to impossible). The Teva Omnium's are offered in three fashionable color choices as well ( I chose the Grape Shake pictured above). Shoebuy.com is a Girl's Best Friend! With an overwhelming (GLORIOUSLY, SO) selection of shoes for the entire family, you can find everything your looking for (and dreaming of) all in one convenient place. Ready to shop The WORLD'S Largest Site for some great new Summer footwear?! One Lucky Reader will receive a $75 Gift Card to Shoebuy.com! Leave a comment~Visit http://www.shoebuy.com/ and let me know which pair of shoes you would love to have for the Summer Season. Entry to this giveaway ends at 12pm PST June 6, 2011. Winner's are chosen randomly through random.org.The winner will be announced in a post within 7 days of the giveaway ending, and contacted through email. The winner will have 48 hrs. to respond or another winner will be chosen. I would love to have FitFlop WalkStar I - Black for this summer. I follow you in GFC. I'd like the Saucony Ride A/C - Light Grey/Blue/Pink Leather/Mesh for my daughter. I'd like the New Balance MX7516.I follow on GFC as Ericka T.
I follow Shoebuy on twitter as humanecats.